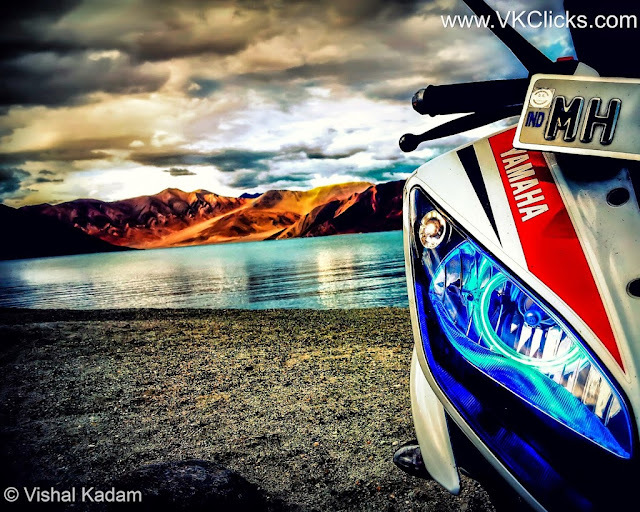 Last year in August 2013, I have rode my bike Yamaha R15 on mighty Ladakh roads , during that trip I have faced extreme weather conditions, bad patches, shivering cold and twists and turns of Ladakh…..but the moment which I have lived on that journey, was the enduring moments of my life.Beside impeccable plan and brave heart you need a good bike to survive the extreme ride of Ladakh. On my entire trip of Mighty Ladakh, I have never felt my bike was exhausted…..she never complained even a single time, No punctures, no engine issues she was pulling strong till the end of my trip, she was the best companion of my trip. Below shot took near Pangong Lake aka 3 Idiots Lake.